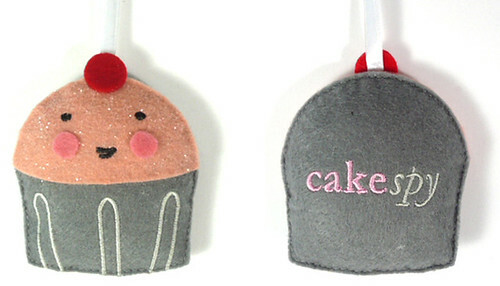 Cake Byte: Brand New CakeSpy Felt Ornaments, and a Giveaway! I'm so excited about these new Cuppie ornaments that I can't even come up with a dessert-related pun! This is a sweet ornament version of Cuppie the Cupcake! This felt puffy ornament is made of layered pink, grey and red felt, finished with embroidery for the eyes and cupcake cup detailing, and of course the pink frosting has some shimmery glittery finish! It measures 3.5" tall. This ornament isn't just for Christmas--it will add sweetness when hung from a window or keep you inspired if hung in your cubicle! And, happily, they were made in collaboration with local company Party Partners! To purchase, visit cakespyshop.com. What was the last baked good or dessert you ate? Just leave your answer in the comment section below before the cutoff of 12 p.m. PST on Friday, 9.25.09; the winners will be chosen at random and announced shortly thereafter. Sorry, US entrants only this time! UPDATE: THE WINNERS! Five winners have been chosen at random, and have been contacted for the correct addresses to send their prize. Congratulations winners, and til the next giveaway, stay sweet! If you are listed here and have not claimed your prize, please email me at jessieoleson@gmail.com.